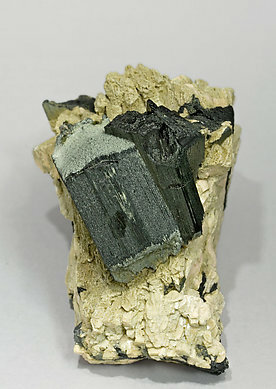 Very well defined Arfvedsonite crystals with acute polycrystalline terminations. 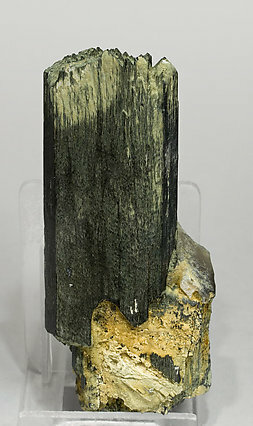 They are bright with a very deep green color and are on a matrix of Orthoclase crystals that very well defined Baveno twins, and black prismatic Aegirine crystals around the base of the Arfvedsonite crystal. 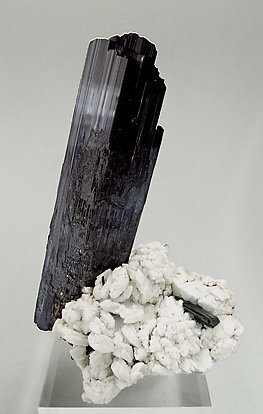 Crystal has multiple termination and it is partially fibrous. It looks very well defined, very aerial, and has excellent luster. It stands on a matrix of small crystals of Albite. 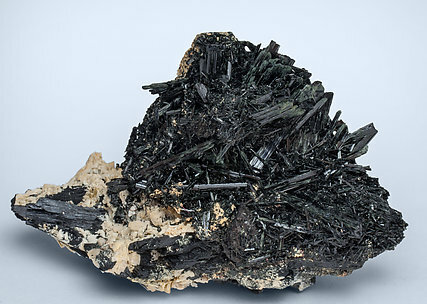 Very acute, prismatic Arfvedsonite crystals that are very bright, have fine vertical striations, a deep black color and are on a Feldspar matrix. The sample has been analyzed and we will send a copy of the analysis to the buyer. A novelty at Expominer (Barcelona) 2011 and also a novelty for Imilchil. 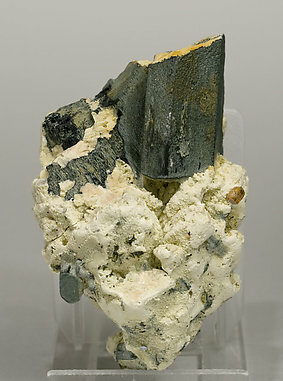 Groups of two crystals of Arfvedsonite with very well defined faces and edges and good terminations, grayish-green color and in Feldspar matrix. We’ll send a copy of the analysis of the Arfvedsonite to the buyer. A novelty at Expominer (Barcelona) 2011 and also a novelty for Imilchil. Doubly terminated crystal of Arfvedsonite with its upper termination polycrystalline and the lower one with simple faces. On matrix, with Quartz and Feldspar. A novelty at St. Marie 2013 (because of the association with Stilbite-Ca). 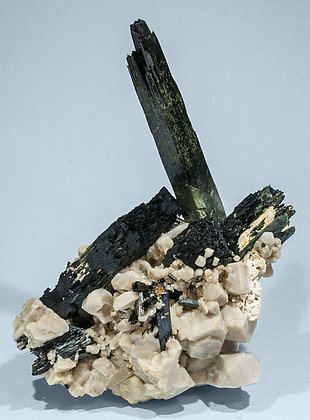 A rare association of Arfvedsonite with Stilbite-Ca. The crystals have very well defined faces and edges and some of them are doubly terminated. They are on matrix with bowtie-like Stilbite-Ca aggregates and small Fluorapatite crystals. A novelty at Expominer (Barcelona) 2011 and also a novelty for Imilchil. 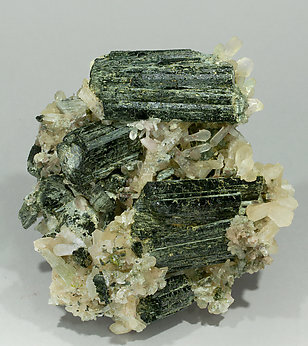 Crystals of Arfvedsonite with very well defined faces and edges, grayish-green color, in Feldspar matrix and small doubly terminated crystals of Zircón. We’ll send a copy of the analysis of the Arfvedsonite to the buyer.